The long-awaited release of the Gen-Arts Sapphire filters for AE has come! And, as an added bonus, Sapphire AE 1.0 is fully compatible with FCP. Sapphire has previously only been available for Shake, Avid and Discreet systems, with pricing ranging from $1800 for Avid to $10,000 for Discreet Flame versions. I note this pricing at the beginning of my review since I can hear the outcry from AE and FCP users- what do you mean, $1699 for a plug-in package or $599 each for one of four sets of component filters! All that I can respond is that the price you pay for Sapphire is evident in the quality of effects which you will generate. Avid and Discreet users know this already. The extensive use of Sapphire in film and broadcast environments testifies to the reputation which this package has already achieved. From a perspective purely of the advancement of the desktop video editing, compositing, motion graphics and effects world, the ability to utilize Sapphire helps desktop system users achieve results which up to this point could only have been attained using the most expensive of systems. Also note that with this release comes compatibility with Adobe Premiere, Eyeon Digital Fusion, Discreet Combustion, Quantel GenerationQ and Media100 844/x. I will be focusing my remarks primarily on Final Cut Pro with reference as well to Combustion and After Effects. The complete Sapphire package consists of 175 plug-ins which can be described in general terms as image synthesizing and image processing effects. The plug-ins subdivide into Lighting, Stylize, Adjust, Blur, Composite, Distort, Render, Time and Transitions sub-categories. Note that for FCP users, the Transitions subcategory filters are not "transitions" in the sense of FCP transitions but rather filters which may be used to create transitions between clips on different tracks. I have had the opportunity to beta test the package and thus have worked with the filters for several months during their development stage. 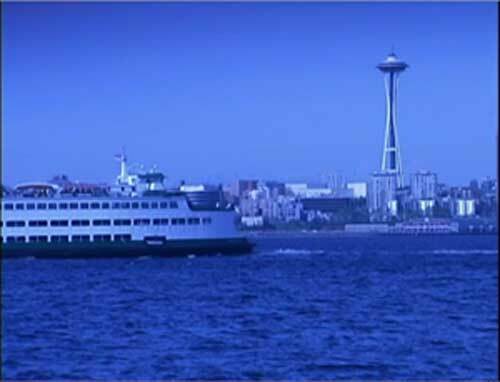 While I primarily tested them within FCP, I also applied the filters to AE 6.0 projects. Evident throughout the testing process up to and including the release version has been the complete stability of the package. Neither FCP 4 nor AE have crashed once during testing nor have any unpredictable results been evident. Since Sapphire is multi-processor aware, rendering has been amazingly-fast, particularly considering the complexity of many Sapphire effects. The quality of Sapphire's effects can be attributed in great measure to the accuracy and precision which went into the coding of each of the plug-ins. Charles Roberts, FCP author and instructor at Fitchburg State College, in fact noted to me that the "mathematics of the package is dead-on accurate." This accuracy also accounts for its complete resolution independence. Your results will be just as precise on HD footage as on DV footage. AE users requiring 16 bit depth formats should note that Sapphire fully supports 16 bit resolution. Installation is straightforward, with the Sapphire installer recognizing any application on the hard drive which will accept Sapphire filters and installing all at once rather than having to make separate installation passes or manually creating alias as is the case with other multi-application plug-in. Copy protection is achieved via a web authorization process which creates a license keyed to the Ethernet address of the host computer. This registration process was not intrusive and did not create any incompatibilities through the use of hardware dongles or software locks. Just a quick glance at any of Sapphire's parameters reveals numerous effect parameters and options. While many might be self-explanatory, others do require reference to documentation. A major strength of Sapphire is its hyperlinked html-based on-line description of parameters for each filter, accessed by just pressing the About button in the filter's interface window. It is a very convenient feature and one which I would hope that other plug-in developers would consider. Finally, before taking a look at some of the specific filters, I wish to utter one final categorical statement-I have never experienced anything even close to Sapphire on the desktop platform. It is like that photo of the cat looking in the mirror and seeing a lion. I have to remind myself that I am not sitting in front of a Discreet Flame but rather in front of my very own G5 using a tool that has been used to create everything from commercials to The Matrix. The experience of Sapphire is nothing less than breath-taking. Now, to show you some of my favorite Sapphire filters! Let's start with the Sapphire Film Effect. Film-look effects are very popular today whether created by 24p cameras or even created in post within software. The Sapphire Film filter combines the best of a number of features found individually within the various film look filters out there but not necessarily all present within one filter. Note the ability to select negative or positive stock. Adjustments also exist for color correction, brightness, gamma and grain as well as simulations of various pull-down patterns. Note that Sapphire does not change the frame rate; rather, it simulates pull-downs and their associated motion. Here are before and after shots of the results of the film filter as well as the parameters applied to achieve this effect. Of course, you will have to try it for yourself to experience the motion changes. One of my favorite Sapphire filters, and one which seems to be utilized with great frequency in film and broadcast, is Sparkles. Note that the effect here is applied to the entire image. 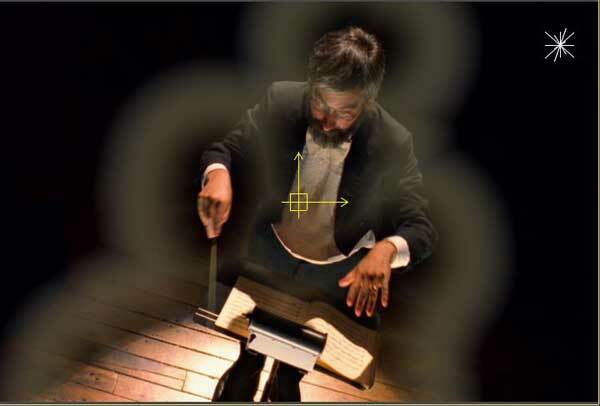 Of course, all of the parameters are keyframable and the Sparkles filter can be particularly effective when size, frequency and intensity of the sparkles are keyframed across the clip. Most Sapphire filters have the ability to specify a matte for application of the filter based upon the value of the matte. An example of utilizing a matte to create a composite through Sapphire is shown below. 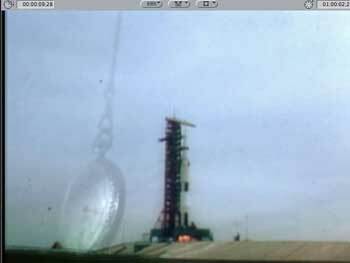 In this footage, also courtesy of Getty Images, the rocket is launching with the swinging watch as a background image. This is achieved by applying Sapphire to the clip and dragging the matte clip to the well. Tweaking the parameters of the EdgeFlash filter produced this composite. Sapphire is at its best, however, in creating all kinds of cool effects. 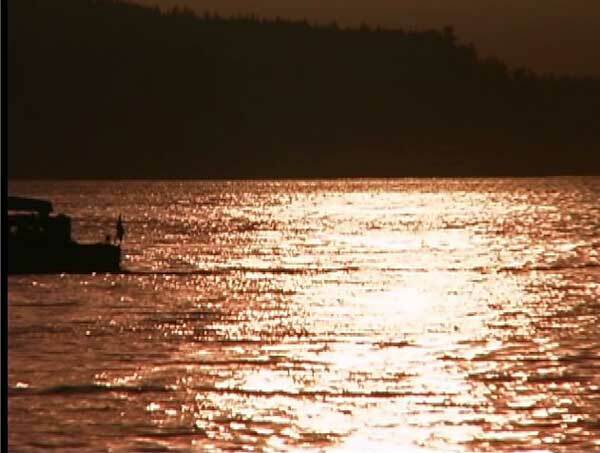 Here I take an image of small boat just off a coastline in an early evening scene. In my opinion, among the most unique and useful of Sapphire's categories are the lighting filters. There are nine types of Glows alone, each with ability to set mattes and with all of the detailed, keyframable controls. The S_GlowRainbow filter places an interesting halo-like effect around a designated area of interest. I created this particular effect in Combustion 2.1, so this also is a good opportunity to illustrate the user interface within Combustion. Note that for filters in Combustion which have numerous parameters, Combustion will split the controls into two separate pages. We will look at another of the lighting effects now, S_GlowEdges, created this time within After Effects 6.0. 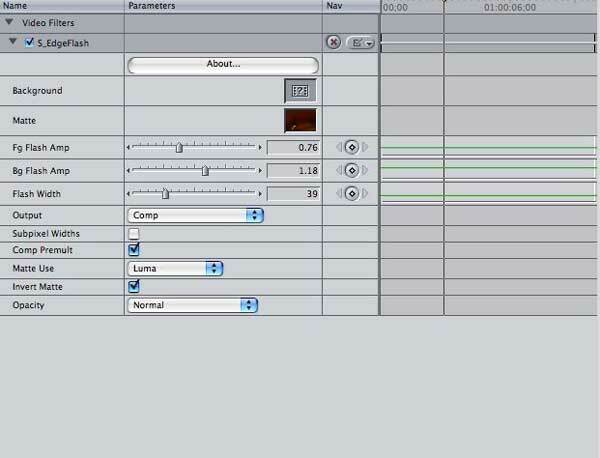 The user interface in the AE effects window is what one would expect from AE-scrubbable parameters and twirl-downs to reach specific adjustments within the parameter. 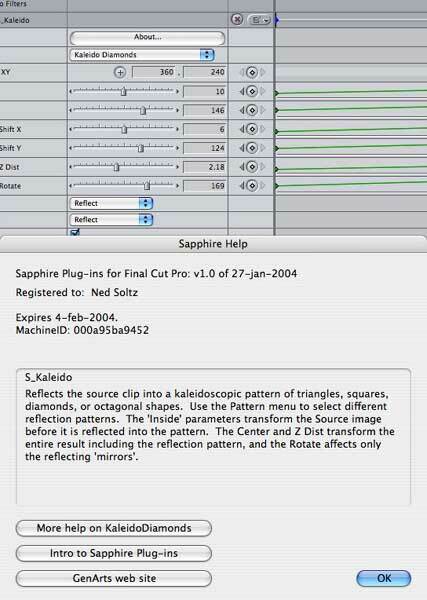 Sapphire AE represents a major addition to the desktop compositor's tool box. The fact that GenArts chose to port this high-end production package to AE, FCP and Combustion platforms is also indicative of how the desktop Mac or PC has taken root in serious production. Despite all of the power that Sapphire brings, its interface is remarkably straightforward. Each filter may have numerous possible adjustments, but accessible and clear documentation provides ample explanation. The fun part begins when tweaking those controls and watching those effects become visual realities. The multi-processing aware coding results in snappy rendering. Its 16 bit capability and resolution independence make Sapphire available to any project in any format. The renders are clean with no field problems on interlaced video. Sapphire has few peers. The aging Final Effects Complete ($895; www.media100.com) boasts particle filters not found within Sapphire and also superb lighting effects. FEC, however, is not multi-processor aware and only renders in 8 bit. Furthermore, a cumbersome Pace anti-piracy system causes occasional crashes and compatibility problems. Boris Continuum Complete and Boris Red 3GL ($595 and $1595 respectively; www.borisfx.com) have image processing capabilities among their excellent multi-faceted plug-ins. 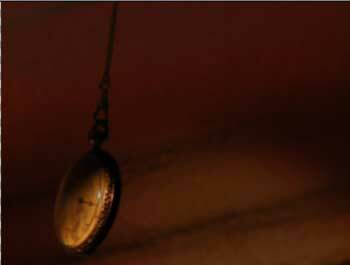 But Sapphire stands out both in the quantity and quality of available effects. Is there more that I would like to see? Possibly particle generators. 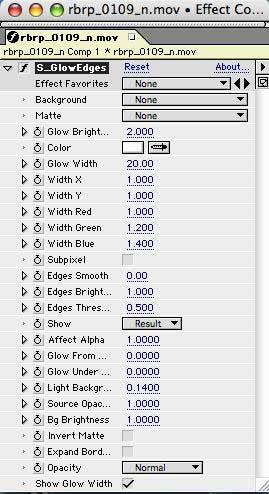 In FCP, I would like to see category groupings of filters like in AE, but this is a shortcoming of FCP. Sapphire is not for all users. If nothing else, price dictates the dividing point between those deeply involved in visual processing effects and those who need such effects but do not require this high-end level of quality and variety. 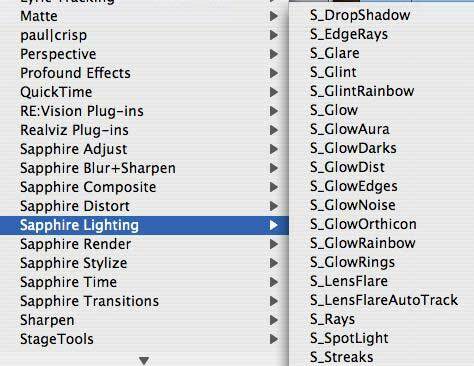 For those users who work in the visual effects realm, Sapphire has no equal. It is truly the greatest achievement to date in image processing. And now it is available to the vast majority of NLE and compositing applications from desktop systems and beyond. Those who have worked with Sapphire in other platforms and who now work in FCP/AE/Combustion and the other applications in which Sapphire works will be among the first to acquire it. Subdividing the complete Sapphire into smaller packages allows greater accessibility for those who only need a specific component of the package. Sapphire is clearly up there with the best products I have ever tested and reviewed and I look forward to utilizing it in my own creative endeavors.